For the last few weeks, MacRumors has been running a special giveaway event, highlighting high-quality luxury bags from manufacturers like Pad & Quill, Intrepid Bag Co, Whipping Post, and Saddleback Leather Company, and now our event is coming to an end with one final giveaway from Intrepid Bag Co. This week, we're giving away Intrepid Bag Co.'s Wayfarer Leather Messenger Bag, which is superbly designed and undeniably stylish. Made from a thick full grain coffee-colored saddle leather, the Wayfarer Messenger Bag is big enough to hold a 15-inch MacBook Pro and it boasts the most pockets out of any of the bags we've given away while also being the most compact. 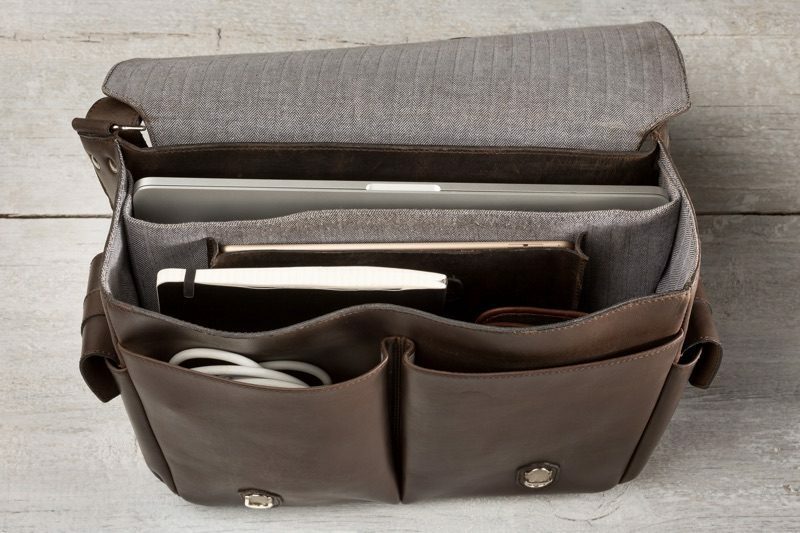 Measuring in at 16 inches wide by 12 inches tall by 4.5 inches deep, the Wayfarer Messenger Bag has a magazine pocket at the back, a large full-length front pocket, and an interior area featuring a padded MacBook pocket, two deep interior pockets, a main compartment, a pen pocket, a phone pocket, and a pocket with a clasp. The whole bag closes up with two front buckles so the contents stay secure during travel. With all of the pockets and space inside the Wayfarer Messenger Bag, there was room to hold almost any Apple device and accessory I own (MacBook Pro, Retina MacBook, iPad Pro, iPad mini and iPhone), with leftover space for a lightweight hoodie, a water bottle, loose papers, two notebooks, three small books, and other small bits and bobs. The Wayfarer Messenger Bag is super rigid and stiff when it arrives, but it should loosen up and wear in with usage, gaining its own unique, lived in look. Along with the aforementioned outside buckles, there's an adjustable shoulder strap and a separate hand strap for carrying it around. Intrepid Bag Co's Messenger Bag was one of the neatest and sharpest I took a look at, with careful stitching, a herringbone lining, and copper accents. Intrepid Bag Co normally prices its Wayfarer Leather Messenger Bag at $469, but one MacRumors reader will win one for free. a Rafflecopter giveawayThe contest will run from today (September 23) at 11:00 a.m. Pacific Time through 11:00 a.m. Pacific Time on September 30. The winner will be chosen randomly on September 30 and will be contacted by email. The winner will have 48 hours to respond and provide a shipping address before a new winner is chosen. See, man-bags can look good. Currently I have to use a man-sack (ruck). For the last few weeks, MacRumors has been running a special giveaway event, highlighting high-quality luxury bags from manufacturers like Pad & Quill ('http://www.padandquill.com/'), Intrepid Bag Co ('https://www.intrepidbags.com/'), Whipping Post ('http://whippingpost.com/'), and Saddleback Leather Company ('http://www.saddlebackleather.comt&utm_source=Mac-Rumors&utm_medium=PR&utm_campaign=PR-Feature'), and now our event is coming to an end with one final giveaway from Intrepid Bag Co. 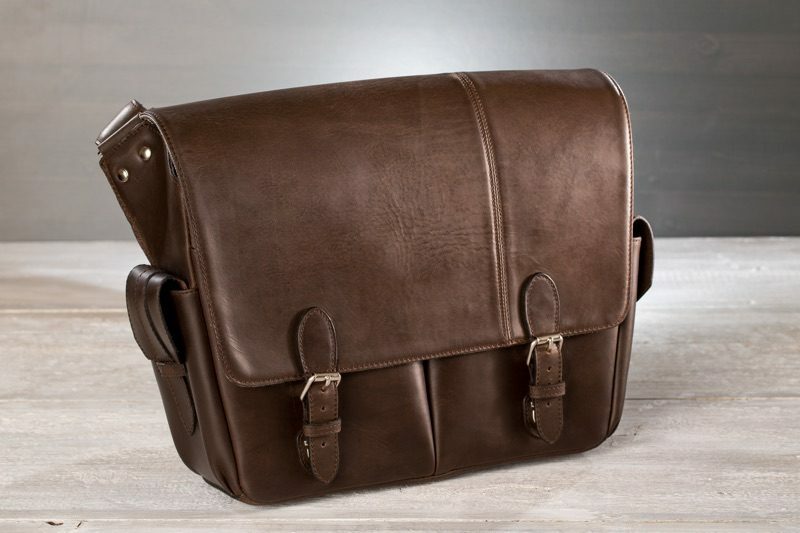 This week, we're giving away Intrepid Bag Co.'s Wayfarer Leather Messenger Bag ('https://www.intrepidbags.com/products/wayfarer-messenger'), which is superbly designed and undeniably stylish. Made from a thick full grain coffee-colored saddle leather, the Wayfarer Messenger Bag is big enough to hold a 15-inch MacBook Pro and it boasts the most pockets out of any of the bags we've given away while also being the most compact. Intrepid Bag Co's Messenger Bag was one of the neatest and sharpest I took a look at, with careful stitching, a herringbone lining, and copper accents. Intrepid Bag Co normally prices its Wayfarer Leather Messenger Bag ('https://www.intrepidbags.com/products/wayfarer-messenger') at $469, but one MacRumors reader will win one for free. To enter to win, use the Rafflecopter widget below and enter an email address. Email addresses will be used solely for contact purposes to reach the winner and send the prize. You can earn additional entries by subscribing to our weekly newsletter ('https://my.leadpages.net/leadbox/145ef7173f72a2%3A104a9fa76b46dc/5754903989321728/'), subscribing to our YouTube channel ('//www.youtube.com/user/macrumors'), following us on Twitter ('https://twitter.com/macrumors'), or visiting the MacRumors Facebook page ('https://www.facebook.com/MacRumors'). Due to the complexities of international laws regarding giveaways, only U.S. residents who are 18 years of age or older are eligible to enter. To offer feedback or get more information on the giveaway restrictions, please refer to our Site Feedback section ('https://forums.macrumors.com/threads/macrumors-giveaways-why-are-they-only-open-to-u-s-residents.1918337/'), as that is where discussion of the rules will be redirected. The contest will run from today (September 23) at 11:00 a.m. Pacific Time through 11:00 a.m. Pacific Time on September 30. The winner will be chosen randomly on September 30 and will be contacted by email. The winner will have 48 hours to respond and provide a shipping address before a new winner is chosen. The bag does look sharp! Man, this is a beautiful bag. Am i the only one that refrains from entering every contest except for the ones I could really use or really want, so that i build up the "lucky karma" for not spamming and diluting every contest with my entries? No? Just me? Alrighty, then. No shot at winning it but still nice bag! Love the leather/suede/canvas combination; very durable.